A Beautiful High Quality Hand Finished Signing Book. The Ultimate in Style! NEW DESIGN. These really are lovely and an ideal keepsake for Mum & Dad as they can look back in years to come and read all the messages written by their guests at their precious baby's Christening. Ideal to stick photos into too. Each book is 30cm x 22cm with 20 pages, which are blank for guests to write their special messages onto. This hard backed signing book is bound with white organza ribbon to add those stylish finishing touches. The book has a cute teddy, hearts, presents & shoes hanging on a baby mobile in stylish neutral colours with diamante decoration & glitter. On the front of the book there is a printed caption saying Christening. Your book will arrive in a presentation box. 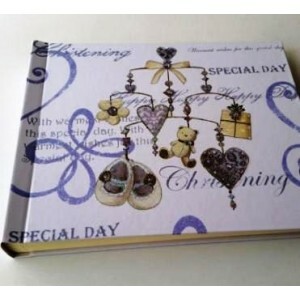 A lovely touch for your Christening and all of your guests will admire this signing book. 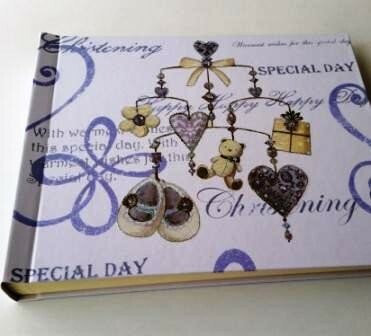 A beautiful keepsake and lovely guest signing book to pass around at the Christening for all your guests to sign.